Pioneers in the industry, we offer iaq monitors and air velocity meters from India. 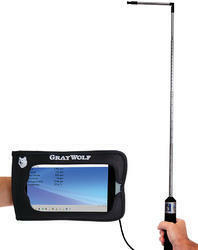 GrayWolf's indoor air quality (IAQ) Monitors make proactive IAQ surveys efficient and easy to conduct. Optimize the balance between facility energy efficiency and occupant health & comfort. 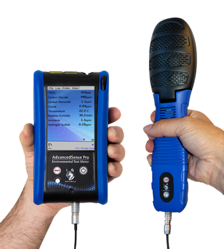 Identify potential IAQ issues before they become problems and respond immediately to complaints with the highly accurate, extremely advanced and most intuitive portable IAQ meters and test instrumentation available today. Excellent documentation is essential for IAQ surveys. GrayWolf harnesses the power of mobile PCs and embedded computers to let you document your IAQ investigation in great detail, and to significantly improve your IAQ test capability. Of course, utilizing the right sensors is crucial; IAQ applications demand accurate sensors with low detection limits, minimal cross-sensitivity and fast response (for walk-thrus). Connect to our AdvancedSense handheld (which incorporates an embedded computer) or to Mobile Windows Pocket PCs, or to XP/Vista/WIN7 PCs or to our WolfPack area monitor. Efficiently generate professional, information-rich IAQ reports. Measures Air Velocity and Temperature. Calculates basic Volume Flow Rate in real-time. Simple desktop data analysis and reporting with included WolfSense® PC software. Accurate for thermal comfort applications (measuring "drafts"), clean room apps (HEPA filters) and Laboratory Fumehood measurements. Wide air velocity range for duct air flow and diffuser volumetric flow measurement. Optional software modules for Equal Area and Log-Tchebycheff volumetric flow calculation, or for fumehood face velocity measurement. GrayWolf Air Velocity monitors, meters, detectors and instruments efficiently log your data and enable enhanced documentation for your surveys by means of advanced software and the power of mobile computing.